The Pahrump Transportation Committee was told Jan. 18 by the state what went wrong with a denied grant application and gave the group some tips on how to get the funding this year. 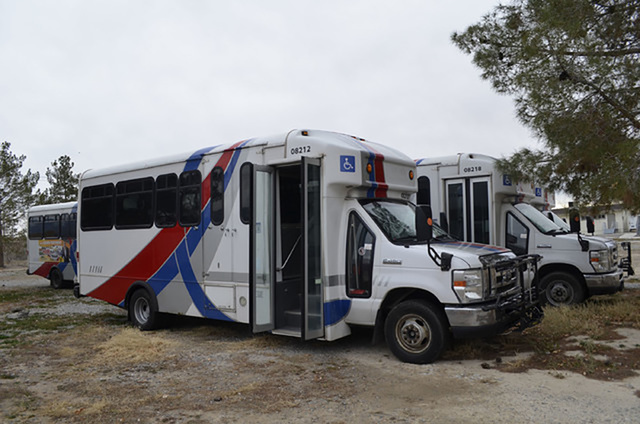 The launch of Pahrump Rural Transit, the town’s first on-demand transportation program, was delayed after it didn’t receive a Nevada Department of Transportation grant in 2016. Since the grant application was denied, the committee has been waiting for details from NDOT to move forward with the new application. Teresa Jarrett, transit manager at the multi-modal planning division at NDOT, said she worked with Susan Holecheck, committee chair, through July to get the grant approved. “There were several things that were deficiencies. One of the problems that we were looking at for moving you forward would be you would have to provide a consistent type of funding. Not just one year or two years, but for an extended time,” Jarrett said. “What we are concerned with is them (the program) developing a ridership and being left in a lurch because they wouldn’t have funding that’s just one of the requirements from FTA (Federal Transit Administration),” Jarrett said. The FTA also requires each transit operator to have at least three months of working capital, as the Highway Trust Fund, a transportation fund, works on appropriations. If NDOT doesn’t get appropriations for the federal money to hand out, the service has to be able to operate for at least three months out, Jarrett said. The town of Pahrump has the NyE Community Coalition, Nye County Nutrition Program, and Pahrump Senior Center transportation. Jarrett said the number of existing transportation programs could present a hurdle. “In this situation, you have lots of entities, and we need to have a general force, that everybody works together and everybody fulfills everybody else’s needs,” she said. Per FTA requirement, transit companies in a working area need to have a “working relationship” with the applicant, Jarrett said. “Because you have so many transit entities in your county, FTA would like to see a coordinated effort, but everybody would work together and agree not to have redundant props,” she said. Jarrett also said the applicant is required to have the money in place to match federal grants. “Wherever you have a grant, you have to have matching funds, you don’t get 100 percent (of funding),” she said. One of the other issues with the match was advertising, Jarrett said. The transportation program would have to have a marketing plan and fee schedule. “You need to already have these contracts for advertising in place. And that acts just like money, you go ahead and you show me a contract and you show me you have a six-month or a one-year contract, for this match, that is cash. We would accept it as cash value. But we did not have anything in place when they submitted their grant. There was nothing there that we could be able to use to try and help them meet their match requirements,” Jarrett said. Albert Bass, Pahrump Transportation Committee member, said Sally Kerr, the new chair for the committee, will be in direct contact with NDOT in regard to the grant application process and the changes. “In the opinion of the transportation committee, even though requirements of the 2016 grant terms were met, they did not stand up to the criteria of the changes forthcoming in 2017. This is why the grant was denied. The committee will be working very closely with the new director and adapting to all of the changes they are incorporating into the transit department at NDOT,” he said. Bass encouraged improving coordination between NDOT and the Pahrump Transportation Committee. “Right now, the only option for our whole community, outside of what the Pahrump Senior Center offers for its seniors is the public taxi service, which is typically unaffordable for the mass majority of our population, so they have zero other options,” Bass said. The new application deadline is expected to move from April to May or June. The grants will also run on a two-year cycle. With changing NDOT requirements, Bass said the Pahrump Transportation Committee will not have any of the information until May or June.